“In Bali, ritual delivers truth through paradox, the Paradox of the Mystery. J oin Tribal Music Guide Stephanie Buffington for an inspirational experience of a lifetime to one of the most enchanting and deeply spiritual cultures remaining on earth. Participate in an 12 day transformational journey that includes inspiring workshops in Balinese music, ceremony and sacred dance led by gamelan masters and village high priests that will prepare us to enter the timeless realms of Balinese magic and ritual. We will be attending an all night full moon temple ceremony and everywhere will be ablaze with colorful ceremonial processions, sacred music and dance. Enjoy creative rhythmical and dance expression sessions plus sharpen your drumming skills in mini workshops. All the drums will be provided with a unique opportunity to visit with Bali’s drum craftsman. Guided silent walk through magnificent rice fields to a secret organic restaurant for lunch. Full day snorkeling excursion to Hidden Paradise, the richest coral garden in Indonesia with a dawn outrigger canoe sail, snorkel equipment snacks inc.
Aum and heartbeat meditation in the ancient Gunung Kawi enlightenment caves. Visit the oldest village in Bali and see the unique handloom ikot weavings made nowhere else on earth. PLEASE ARRIVE AT LAX BRADLEY BUILDING, meet at the China Airlines passenger area. Arrive Bali transfer to Beach Front resorts for check-in and overnight stay. Enjoy the pools for a moonlight swim or have a meal at a colorful boardwalk restaurant. A good night’s sleep is recommended. coach transfer to Jungle Villas in Ubud area. Walk to the exotic Monkey Forrest and learn your way around the village. This afternoon we will explore Ubuds world famous shopping bazaar and textile museum. The late afternoon is free for a healing massage treatment or swim. Tonight we will enjoy a Balinese feast under the stars and see an authentic men’s kecak trance dance by torch light. This morning we will have a drum workshop and small performance and jam with Gamalan master teachers. We will visit the Balinese drum craftsman and see the making of drums from start to finish. Drums and percussion can be purchased for a fraction of the cost with a special TMT discount. We will spend the morning surrounded in flowers and palm leaves with the local village women and learn the traditional way the elaborate ceremonial offerings are prepared as works of art and expressions of devotion. We will learn the meaning of the blessing rituals and how to participate in tonight’s ceremony from the village high priestess. In the afternoon we will travel to Mas, one of Bali’s most sacred and largest temples, to witness the a colorful procession of offerings and gongs and stay there on into the night for the special blessing of the High Priest and night of Balinese sacred trance dancing. Sarongs and temple gear required. Departure for East Bali and Tenganan / Amed with overnight at Hidden Paradise. AM tour of the Candi Dasa Bat Temple, an extraordinary seaside temple and home to thousands of bats. Temple gear required. After lunch we will visit Tenganan Bali’s oldest village to meet with a master musician in his home where we will have the opportunity to hear and play ancient instruments. Here we will also see how the ancient double ikat textiles are hand loomed. This is the only village in Bali where these weaving techniques are used. A wonderful point of interest for the textile lovers. In late afternoon we will continue our journey to Amed through the spectacular jungle vistas with the sacred Agung Volcano as a looming backdrop. The evening is complete with ocean front feast, after dinner jam with the locals and moonlight massage. Rise early for dawn meditation and the spectacular sunrise over Lomboc as seen from the beach. Outrigger’s depart for snorkeling adventure to a small wreck teeming with colorful fish and coral. Lunch and check out. The coach returns to the Villas in the Ubud area via the magnificent Tirtaganga Water Palace where we will take a ceremonial walk on water ! AM excursion to Gunung Kawi an 11th century temple carved into the mountain side with ancient meditation caves and healing sounding chambers where it is that one can experience the heart beat of the earth. A special ceremony will be held there. The afternoon is free for massage, art museum, or shopping. This evening we will jam with a local world music group at an Ubud hot spot. We will take a magical hike to a secluded restaurant deep within the picturesque rice fields of Ubud for a sumptuous organic food grown just inches from your table. Later we visit renowned master healer Tjokorda Rai for a personal treatment or just come to observe a real shaman healer at work. His work has profoundly touched all that have had the unique opportunity to be treated by him. AM we will travel to Tirta Empul sacred bathing pools where you may dip in what the Balinese consider the “Springs of Immortality” where we will have our own purification ritual there in this holy site. 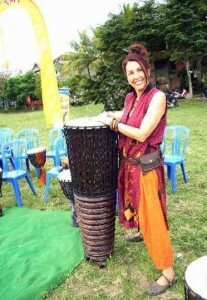 Participate in and co-facilatate with Christine Stevens in the Annual Bali Sacred Rhythm Circle in partnership with local drum manufacturer and drummers from around the world. Our event will raise much needed funds for a local orphanage for handicapped Balinese children. This event will be our chance to forge trans-cultural unity and create an unforgettable exchange of high spirits. We will hold a Parting Ceremonial Feast for our village family, priest, dancers, and temple musicians that evening as the grand finale of our trip. Morning free for last minute shopping and packing or massage. *Due to the nature of the tour please be aware that this itinerary is subject to change without notice at the discretion of the tour leader as unforeseen events and circumstances dictate. Every effort will be taken by TMT to keep the all the activities itinerary as planned. All transfers and group transportation. 11 nights deluxe jungle villa, all breakfasts, three dinners. Based on double occ. Deluxe single upgrade air cond., private bath, etc. available. All workshops and sacred site entrance. All excursions, and group functions inc. Outrigger snorkeling trip. Group is limited to 12 participants maximum. A $600 deposit is required to hold your place. Deposit payable by credit card or PayPal. A check for the balance is due within 30 days of departure. Spa treatments and massage approx. $10 to $20 per session depending on the type of treatment. Dinners, lunches and drinks not mentioned in itinerary. There are delicious international restaurants in Ubud for all tastes and budgets as well as snacks available at the villas. Budget $25 to $40 per day for meals. A travelers packet will be sent to you when you have registered that will have all the detailed information you’ll need. Trip and medical insurance for your tour is your responsibility and advised. Participation in the group program is not required but highly recommended.